Summary: Learn how to make repairs to a patio and driveway, level block paving, replace a broken stone slab, make repairs to concrete and make repairs to tarmac. Patios and driveways can be constructed from paving slabs, block paving, tarmac or concrete, but all may need to be repaired at sometime. Here we look at how to carry out repairs to the patio or driveway if part of the surface is cracked or has become unstable. One of the most common problems is an uneven surface caused by the blocks sinking due to poor construction. Place a length of batten over the problem area and mark with chalk all the blocks that do not touch the underside of the batten. Remove the marked blocks, levering them up with a cold chisel or old flat-head screwdriver. With the blocks removed add an even layer of sand that will raise the blocks. Level the sand with a trowel. Reposition a single block to gauge whether you have added enough sand. Replace the blocks. Use a spirit level to check they are level with the surrounding area. Brush sand into the joints between the blocks. With the uneven blocks removed add an even layer of sand that will raise the blocks levelling it with a trowel. In time paving slabs may become loose and unstable or cracked due to frost or a fault in the stone. If the slab has been laid on sand the broken slab is easily removed and replaced. Here we are looking at replacing a slab that has been laid on concrete. Break the cracked slab with a cold chisel and lump hammer. Wear protective goggles and gloves. Lift the pieces of broken slab with a pry bar using a block of wood to provide leverage. 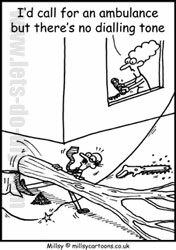 Take care not to damage the edges of the surrounding slabs. With the old slab removed, use a lump hammer and cold chisel to chip away any mortar and debris from the slab bed. Mix up a small amount of mortar (1 cement to 4 sand) and apply it to a depth of 50mm (2in), smoothing the surface with a trowel. Carefully reposition the slab. 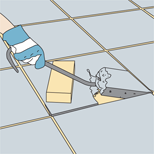 Use a rubber mallet to tap the slab into the position. Check that the new slab is level with the surrounding paving using a spirit level. Allow the mortar to set for 2 days before pointing the joints. Whether you use a dry or wet pointing mix will depend on what was used originally when the patio was laid. A wet mix should consist of cement and sharp sand in a ratio 1:3, using only enough water to make a stiff mix. Apply the mortar to the joints with a pointing trowel. For joints less than 12mm (½ in) the mix should be 1:1. If the joints are wider than 12mm (½ in), the mixed should be 3 sand to 1 cement. The dry pointing mix should be carefully poured and brushed into the joints. Lift the pieces of broken slab with a pry bar taking care not to damage the surrounding slabs. Cracks in concrete can be easily repaired using proprietary masonry filler or a mix of concrete made up of cement, sand and fine gravel. 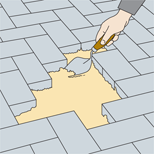 Very shallow cracks should be opened to a depth of 15mm (3/4in) with a cold chisel and club hammer. Undercut the edges at the base of the crack to allow the filler to grip. Brush the crack clean of dirt and debris. Apply a water and PVA bonding agent solution (3:1) to the crack. When the bonding agent is tacky trowel the concrete or masonry filler into the crack. Smooth the surface with a trowel. Crumbling edges of a concrete surface are also easily repaired. Clean the damaged area removing any dust and loose chippings. 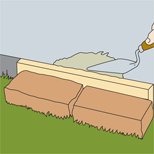 Position a small section of plank tight against the damaged area using bricks or stakes to support it. Make sure the top edge of the timber is flush with the top of the concrete. Apply a coat of diluted PVA to the damaged area: 5 parts water to 1 part PVA. When the PVA is tacky, apply the filler or concrete mix ensuring it is tightly packed to avoid air bubbles. Smooth over the surface with a trowel. Cover the area with polythene for three days to allow it to set. You may choose to leave any edging in place longer to support the concrete whilst it sets hard. When the PVA is tacky, apply the filler or concrete mix ensuring it is tightly packed to avoid air bubbles and smooth over the surface with a trowel. Small holes in tarmac can be repaired using cold-mix tarmac that can be bought in bags. Clean out the dirt and loose chippings from the hole. Use a trowel to fill the hole with the cold-mix tarmac. Fill the hole until the cold-mix tarmac is proud of the surrounding tarmac surface. Using a rammer or the flat end of a wooden beam to tamp down the cold-mix tarmac until it is level with the surrounding area.